Crawl space mold remediation is rarely worried about as much as basement mold. 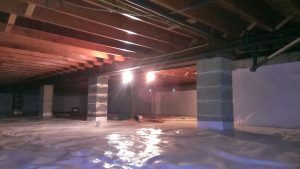 Did you know that if your home is built not on a basement but on a crawl space, that you can have the same mold spore issues in your home as you could with a basement? Fortunately, crawl space mold remediation and prevention are possible. 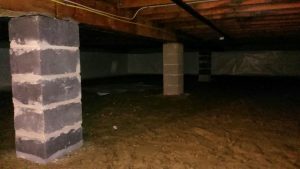 Crawl space encapsulation is the best method of protecting your home from mold growth due to a damp crawl space. But crawl spaces should not be neglected. They are wonderful places for all kinds of mold species to live happy lives, while affecting the air quality in the home above and causing various health issues. Even though the crawl space doesn’t really seem to be “attached to” your living area, it is. Mold spores easily find their way through cracks and spaces up into the home above. In addition, people sometimes use crawl spaces for storage, but wooden and cardboard surfaces are great places for mold to grow if the environment is damp. Remove any mold that is already there. This is done be applying fungicide to all exposed surfaces, and coating all exposed wood with an anti-microbial paint. Extremely thick (12 millimeters) plastic is used to cover the floor and walls of the crawlspace, and it is fastened very securely all around. This plastic also has an anti-microbial coating to provide an extra layer of protection against future mold invasions. Insulate the crawl space walls and seal up any spaces or cracks where air can come in. Air brings moisture, and moisture causes mold. The access door is also insulated and air-tight sealed. The final step is to make sure the air is conditioned and moisture constantly removed, from this point on. This is usually done by installing a de-humidifier, which can keep the relative humidity below 50%, necessary for preventing mold. The result is a dry, clean, sealed-off crawl space that you can safely use for storage, but most importantly, that you can feel safe living above. Got crawl space mold? Contact us to get rid of your mold problem.